One of Balthazar’s Massive Mirrors Just Fell Off the Wall [Updated]Early reports suggest some customers sustained minor injuries. George Clooney Hosts Dinner at Caravaggio; The Beckhams Eat at BalthazarPlus: Anna Kendrick hangs at Omar’s, and more, in this week’s roundup. Ryan Sutton Weighs in on Balthazar’s Bathroom AttendantsThey’re on the wrong side of history, he says. Balthazar’s Bathroom Attendants Will Keep Their JobsPhew. Which Job Is Worse: Balthazar Bathroom Attendant or Business Insider Anything?Henry Blodget strikes again. Balthazar Cans Its Bathroom Attendants (Again) [Updated]“Although I’m looking forward to standing at Balthazar’s urinal without another man staring at me I’ll very much miss my bathroom attendants,” McNally says. Watch Balthazar’s Frites Masters in ActionThat’s a whole lotta potatoes. Keith McNally Closing Pulino’s in January, Will Reopen As Cherche MidiThe restaurateur says closing a restaurant is a career first. Ex-Balthazar Chef Riad Nasr Plans ‘Little Break’ From CookingHe’s been working nonstop for twenty years. Doug Quinn Closes In on Hudson Malone; Starbucks Bans ButtsPlus, the best pork chop you’ve ever had in your life, knaidels galore, and more, in today’s Leftovers. 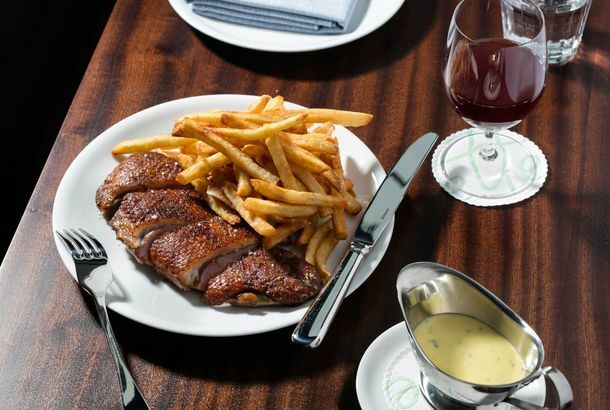 Keith McNally Responds After Critic Slams Balthazar LondonOh snap. How Keith McNally Keeps His EdgeAlso, he drinks Beaujolais. Balthazarnomics: Plotting the Famed Bistro’s Menu PricesThe more things change, the more the braised short ribs stay the same. Keith McNally Once Used a Restaurant Loan to Finance a FilmSpoiler alert: He made the money back. London’s Balthazar Has Hired a ChefMarco Pierre White’s protégée will be manning the stoves. Balthazar London Is Now HiringMcNally’s first London restaurant is looking for a few attentive cooks. Keith McNally’s London Restaurant Will Indeed Be a Second BalthazarIt opens on February 12 of next year. Daily News Still Loves Balthazar; Tejal Rao Keen on GovernorPlus: Ryan Sutton finds the world’s best $9 burger, Wells deems Rosemary’s more or less worth the wait, and more of this week’s critical reviews. Pig: A Restaurant Coming to UCB, Before Pigg Gets to UmamicatessenThe new play skewers everything in food culture that is still yet to be parodied. Export Report: Checking In on Old Homestead, Balthazar, and MomofukuNo word whether or not Vegemite pork buns will be sold at Momofuku in Sydney.